Probiotics have been used successfully to treat many gastrointestinal problems as constipation, bloating, inflammation, Candida and much more. But what about probiotics for food allergies? Can probiotics help solve food allergy problems? A neurologist, Dr. Natasha Campbell-McBride has developed a treatment strategy (GAPS) for autism, autoimmune disorders, food allergies and intolerances. A cornerstone is the use of probiotics to repair the gut lining and restore balance to the immune system. I’ve tried parts of this approach and had very good results with my own problematic gut. The main reason for food allergies/intolerances is a “leaky gut.” If your gut lining is damaged by an abnormal microflora, food is not properly digested but is absorbed through a damaged gut wall. Substances entering your body can cause problems with your immune system leading to allergic reactions. Many people try to identify which foods they react to but this can be very hard. The damaged gut wall can absorb most foods partially digested causing either an immediate or a delayed allergic reaction. As long as your gut wall remains damaged you can change your diet indefinitely without getting anywhere. Many people with allergies get frustrated over this. Focus your attention on healing your gut wall with high-quality probiotics and a correct diet. Once your gut wall is healed foods will be digested properly before being absorbed. This can remove many food allergies and intolerances. According to this approach, the root cause of allergies and intolerances are found in the (wrong) way your immune system deals with pollen, foods or other substances. Your immune system is controlled by your gut flora—the delicate balance of beneficial bacteria in your gut. As long as your gut is working optimally you will have no or minimal allergic symptoms. However, problems and imbalances in your gut can disturb parts of your immune system and lead to allergies and intolerances. However, not all allergies are the same; some food allergies and intolerances cause symptoms that show hours, days or sometimes weeks later. This makes it hard to determine which food caused the reaction. Not so with acute anaphylactic allergies that belong to a different group of allergies not mediated by the same immunoglobulin. These reactions can be fast and very serious. Since your gut is involved in the development of allergies, consuming high-quality probiotic bacteria strains has proven very effective to get to the root cause of this kind of allergies. Food allergy symptoms—why so confusing? The lining of your gut is being maintained by your gut flora; beneficial bacteria in your stomach create an environment where your digestive tract remains strong, healthy and protected from bad bacteria and harmful substances. But because of an abnormal gut flora, the gut lining can start to deteriorate–the lining turns porous and leaky resulting in foods not being digested properly. If the food in your stomach only becomes partially digested before it is being absorbed into your bloodstream, your immune system may not recognize these substances but might view them as unwelcome, foreign or harmful; this can cause all those allergic reactions and symptoms mentioned. Take a drop of the food in question (if the food is solid, mash and mix with a bit of water) and place it on the inside of the wrist bedtime. Let the drop dry on the skin, then go to sleep. In the morning check the spot; an angry red reaction means to avoid that food for a few weeks; then try it again. If there is no reaction, then go ahead and eat a small amount. This simple (and free) test works surprisingly well to determine what foods are causing allergic reactions. You can do it as often as you like and you don’t have to pay for expensive, time-consuming allergy testings in a hospital. When my wife developed food allergy years ago, it was very difficult to determine what specific foods caused the allergic reaction. And even when we did discover a few specific foods, we could never be completely sure it that those were all that triggered an allergic reaction; there might be other foods that could trigger a reaction but it was no way to know for sure. We realized that we needed to attend to the root cause of food allergies, not only the symptoms. If you could do this also, then you would treat the origin of your problems without worrying too much about what specific foods trigger an allergic reaction. Please repeat, what exactly is the root cause of allergy? A damaged gut lining; according to the GAPS approach. Happily, using probiotics for food allergies and to repair the gut lining turns out to be a fairly simple. In comparison, conventional allergy testing and medication can be very time-consuming and expensive. Healing mean the ability to consume foods that earlier caused an allergic reaction. Probiotics are anti-allergenic and essential for optimal digestion of food and absorption of nutrients. Friendly bacteria also help the body produce vitamins, absorb minerals and aid in the elimination of toxins. Many studies on probiotics confirm its efficiency in treating food allergies. My wife and I were thoroughly impressed by the effectiveness of this very simple approach. Stocks are great for quickly healing the digestive tract. The first goal is to remove constipation, bloating, diarrhea and gut pain. This is done by consuming meat stock until other foods are slowly reintroduced. Consume a small amount of meat stock. 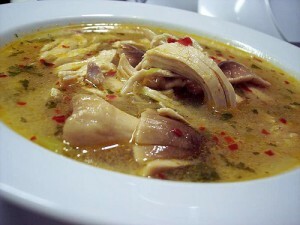 During the day, eat only fish & meat stock and vegetable soups. My stomach just loves meat and chicken stock; it’s like gut-balm. However, my wife cannot eat the heavy meat stocks because of all the fat. She feels much better when consuming the lighter chicken broths. Meat and fish stocks provide building blocks for the rapidly growing cells of the gut lining and they have a soothing effect on areas of inflammation in the gut. That is why they aid digestion and have been known for centuries as a healing remedies for the digestive tract. Avoid commercially available soup stock granules or bullion cubes; they are highly processed and are packed with harmful ingredients. Chicken stock is particularly gentle on the stomach and is very good to start with if you have serious food allergies. It is essential to use bones and joints, as they provide the healing substances, not so much the muscle meats. Ask the butcher to cut in half the large tubular bones, so you can get the bone marrow out of them after cooking. You can make fish stock the same way using a whole fish or fish fins, bones, and heads. After cooking, take the bones and meats out and sieve the stock to remove small bones and peppers. Strip off all the soft tissues from the bones as best as you can to later add to soups or encourage your patient to eat all the soft tissues of the bones. Extract the bone marrow out of large tubular bones while they are still warm. The gelatinous soft tissues around the bones and the bone marrow provide some of the best healing remedies for the gut lining and the immune system. Remove all of the soft tissues from fish bones and heads and reserve for adding to soups later. The meat or fish stock will keep well in the fridge for at least 7 days or it can be frozen. Consume warm meat stock all day with meals and between meals. Avoid microwaving the stock but use a conventional stove. Try to consume all the fat in the stock as these fats are essential for the healing process. Add some probiotic food into every cup of stock. We make our own homemade fermented vegetables as this is one of the best ways to add natural bacteria to your gut; don’t underestimate the power of homemade fermented foods. To get a wider variety of bacteria strains, try to eat different kinds of fermented foods like homemade yogurt, kefir, sauerkraut, natto, or kimchi. In addition, using culture starters give a much better effect on the gut as the fermented foods will contain many more bacteria. Start out slow! Probiotic bacteria are very potent and it is advisable to avoid “healing crisis,” or detox symptoms. If taking a probiotic supplement, start with a low dose and see how you feel; if you tolerate it you can increase the dose. Detoxifying is a process that can take days, weeks or months; be patient, go slow. If uncomfortable speak with your health practitioner. If you are sensitive to dairy (as seen from the sensitivity test or a reaction when reintroducing it), then into every cup of meat stock or soup add juice from your homemade sauerkraut, fermented vegetables or vegetable medley. Make sure that the food is not too hot when adding the probiotic foods, as the heat would destroy the beneficial probiotic bacteria. Bring some of the meat stock to a boil, add chopped or sliced vegetables: onions, carrots, broccoli, leeks, cauliflower, courgettes, marrow, squash, pumpkin, etc. and simmer for 25-35 minutes. You can choose any combination of available vegetables avoiding very fibrous ones, such as all varieties of cabbage and celery. All particularly fibrous parts of vegetables need to be removed, such as skin and seeds on pumpkins, marrows, and squashes, the stalk of broccoli and cauliflower and any other parts that look too fibrous. Ginger tea with a little honey between meals is excellent for your gut. After the first introductory diet above, the goal now is to continue the healing process you’ve started. Slowly introduce other foods as shown below. Raw organic egg yolks: Begin with one egg yolk per day and gradually increase the amount until you eat an egg yolk with every bowl of soup. Then try soft-boiled eggs. If you suspect egg allergy, do the sensitivity test. Otherwise, you can eat as many egg yolks you want per day; they are digested quickly and are very nutritious. Meat and vegetable stews and casseroles Add salt and fresh herbs but NO hot spices. Fat contents should be high. In fact, more animal fat promotes healing. Consume probiotics with every meal. You can also add fermented fish and homemade ghee. Add scrambled eggs with plenty of ghee, goose or duck fat Cooked onion: 3 tablespoons of ghee, add sliced large white onion, cover and cook for 20-30 minutes on low heat. Fry small thin pancakes using ghee, goose fat or duck fat. Freshly pressed vegetable juice Start with a little carrot juice. Filter the juice and drink it slowly or mix with homemade yogurt. Then try juicing celery, lettuce, and fresh mint leaves. Drink on an empty stomach in the morning and afternoon. Apple puree. Peel and cook apples in water until soft, add ghee to it and mash. Raw vegetables like lettuce and peeled cucumber Gradually add carrots, tomatoes, onion, cabbage, etc. Apple, pineapple, and mango. Avoid citrus fruits. Gradually introduce baking cakes and other sweet things allowed on the diet. Use dried fruit as a sweetener in baking. Using probiotics for food allergies and intolerances does work, but it does not magically remove all symptoms quickly. Stay focused and be persistent with the diet recommendations speeds up the process. How long it will take depends on each individual’s circumstances. Hopefully, you will feel better soon.